It is important to find the right balance between being careful when you are exercising to prevent injury and continually progressing to increasing strength but for the most part, the higher the intensity the better the strength gain. Unfortunately, just going through the motions without attaching energy and being there emotionally will not get the job done. What will result is frustration, fatigue and poor results. Quantity does not rule…it is intensity: the concentration of physical energy given forth in a given moment that plays the starring role. It all begins with your ability to focus and concentrate energy and amplify your desire, drive, motivation and will; all emotional attachments. It has nothing to do with how many sets or repetitions you perform or what equipment you might be using. Intensity is the star of this show. Achieving intensity when you exercise and strength training requires a strong dose of determination and sustained concentration because staying focused is easiest during the first repetition but only those steadfast in their determination and concentrations will ever reach the highest levels of intensity in their final repetition and enjoy the benefits of doing so. If you hope to set the growth machinery into motion for an increase in strength then you must trigger the adaptive response of growth. Your muscle must literally be broken down at the cellular level for this to happen. 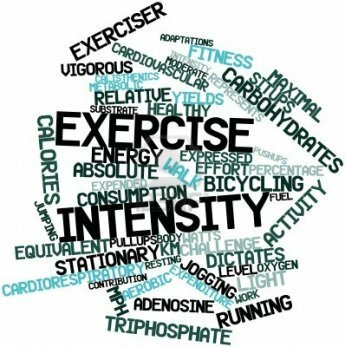 If the intensity is high then a very small amount of training is required to produce significant results in your strength and muscle tone ensuring you receive maximum results in the least amount of time. High intensity means working your muscles to the point of fatigue when no more repetitions can be performed. Choose a weight that you can lift using proper form at least 10 times with effort but no more than 15 (if you can lift it 15 times it is too light). Strength training with weights that are too light even with high repetitions does not build muscle effectively just as aerobic activity does not. Your muscles must be challenged and stimulated to grow and you do that with intensity. Using your time wisely and focusing on quality training (focus, intention, attention and determination) rather that quantity is the key to achieving your dream body. It’s all about “being there” consciously…that’s what gets the job done. If you are finally ready to give up all the “false” notions about losing weight and keeping it off then “Stop Weight Loss Resistance” was created just for you.